BRUSSELS: Google has been fined $1.7billion by the European Union for indulging in restrictive trade practices. In a third similar case going against the tech giant, Google was accused of putting limitations on some websites displaying ads sold by its rivals. 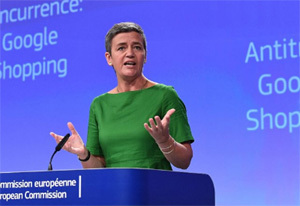 EU anti-trust commissioner Margrethe Vestager told a press conference on Wednesday that the tech giant had abused its dominant position by forcing customers of its AdSense business to sign contracts agreeing they would not accept advertising from rival search engines. “The misconduct lasted over 10 years and denied other companies the possibility to compete on the merits and to innovate,” she said. The Silicon Valley's tech firm was fined a record €4.3 billion last year for abusing its market dominance in mobile, and €2.4 billion the previous year for manipulating search results. It is appealing against both the verdicts. Vestager said changes Google made after the EU case increased the visibility of rivals from 6 percent of search results to 40 percent.